Earlier this week we attended the Centre for Youth Literature’s YA Showcase for 2017. At this fantastic annual event, a host of different publishers share the most exciting new releases for teen readers coming out next year. Carve the Mark by Veronica Roth – The first book of a brand-new sci-fi and fantasy series from the bestselling author of Divergent. We Come Apart by Sarah Crossan and Brian Conaghan – A contemporary story of star-crossed lovers by two rising stars in YA. 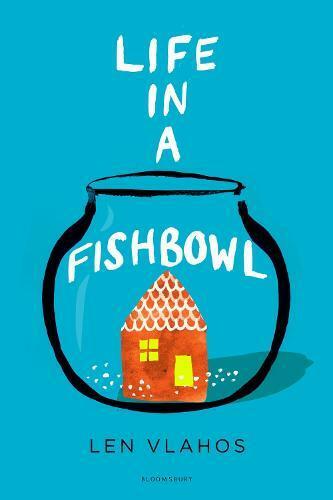 Life in a Fishbowl by Len Vlahos – A tragicomedy about a girl whose father sells his life to a reality TV show producer after being diagnosed with a terminal brain tumour. My Life As A Hashtag by Gabrielle Williams – We absolutely love this author’s books and her new one looks set to be just as funny, heart-warming and fast-paced as the others. Vigilante by Kady Cross – Here’s a teen mystery perfect for teens who like Veronica Mars. Night Swimming by Steph Bowe – Crop circles, a musical with goats and more feature in this quirky story which takes place in a colourful small town. Untidy Towns by Kate O'Donnell – This Melbourne blogger/bookseller’s debut is part Nick Earls, part Gilmore Girls. Ballad for a Mad Girl by Vikki Wakefield – A ghost thriller with a literary feel from an Australian author we love. Beautiful Mess by Claire Christian – Last year’s Text Prize winner gives us a raw, affecting coming-of-age story that starts a conversation about mental health. The Edge of Everything by Jeff Giles – High-stake, heart-pounding action-romance with the bad boy from hell (literally). Amelia Westlake by Erin Gough – Two very different teenager girls come up with a grand feminist hoax to bring down their elite school, and somehow end up falling for each other. The Secrets We Share by Nova Weetman – The author’s follow-up to The Secrets We Keep, which thoughtfully tackled themes of trauma for tween readers. Remind Me How This Ends by Gabrielle Tozer – A new mature YA romance from the 2015 Gold Inky Award winner. The One Memory of Flora Banks by Emily Barr – This romance-thriller about a girl with short-term memory loss has already had sold foreign rights in 16 countries. Begin, End, Begin: A #Loveozya Anthology edited by Danielle Binks – A veritable feast of homegrown talent is featured in this anthology. The Secret Science of Magic by Melissa Keil – The third book from Australia’s queen of YA rom-coms features a maths genius and amateur magician. Finding Nevo by Nevo Zisin – 20-year-old activist Nevo Zisin is an inspiring young person who identifies as transgender; this is their story. Friends Anonymous by Simmone Howell, Fiona Wood and Cath Crowley – Three of our favourite OzYA authors have collaborated on this novel of an unlikely friendship and we couldn’t be more excited. Frogkisser! by Garth Nix – For fans of Howl’s Moving Castle, this story is 50% fairytale, 50% adventure and 100% hilarious. In The Dark Spaces by Cally Black – An electric rollercoaster ride through deep space comes from the newest Ampersand Prize winner. The Things We Promise by J.C. Burke – Set during the 90s, this coming-of-age tale about a sister and her older brother sounds beautiful and heartbreaking. Living on Hope Street by Demet Divaroren – Have your tissues ready for this contemporary story of working class families in Melbourne. Gap Year in Ghost Town by Michael Pryor – Smart and snappy ghost hunting adventures that will appeal to fans of Supernatural. Geekerella by Ashley Poston – Described as ‘part romance, part love letter to geek culture, and totally adorbs’. Next year also sees a stack of fantastic YA series continue such as The Illuminae Files, Zeroes, The Diviners, Paladero, Silver Stars, Dragonkeeper, Throne of Glass, The Medoran Chronicles, and more. Plus… you can also expect to see brand-new books from YA superstars Margo Lanagan, Scot Gardner, E. Lockhart and Becky Albertalli. All in all – 2017 is shaping up to be a bumper one for teen books!